Chocolate spoons are loads of fun to prepare. 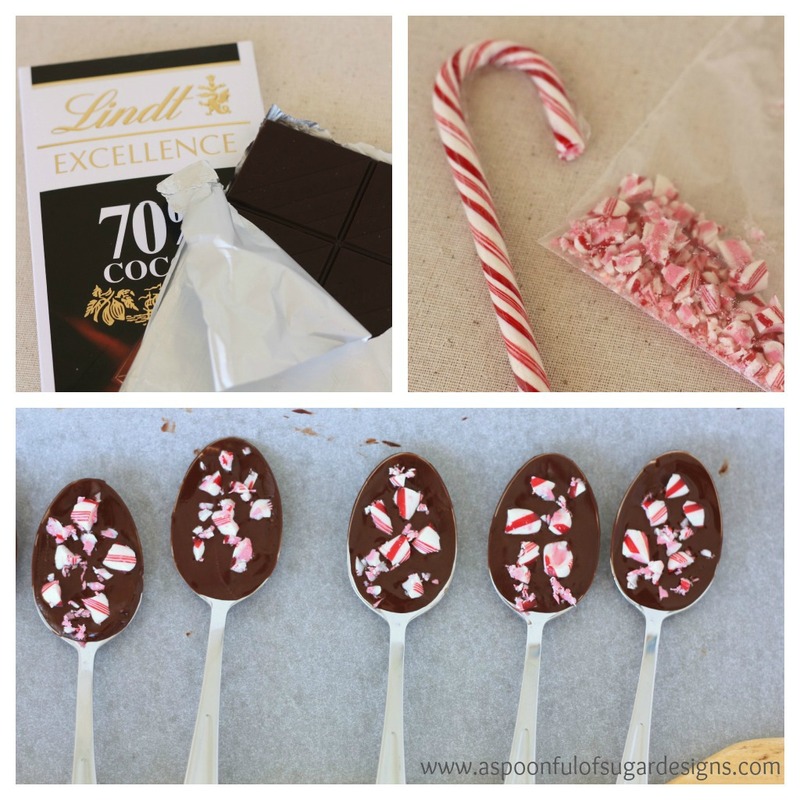 Who doesn’t enjoy creating with chocolate and candy canes? We are making up a big batch of chocolate covered spoons to include with our Hot Chocolate Mix this Christmas. Chocolate Spoons are lovely swirled through Hot Chocolate or Coffee for a rich, delicious taste. You can use any good quality chocolate We used Lindt Dark Chocolate but you could make them in any type of chocolate – milk, dark, or white. You can leave them plain or decorate them with crushed candy canes or sprinkles. Whatever takes your fancy! 1. Wash and dry spoons. We used metal spoons but you could use plastic. 2. Place candy canes in a ziploc bag and crush with a rolling pin. 3. Melt chocolate.Spoon the melted chocolate onto the spoons, and smooth with a knife. Top with shards of candy cane. Allow to set. You can speed up the process by placing them in the fridge for 15 minutes. 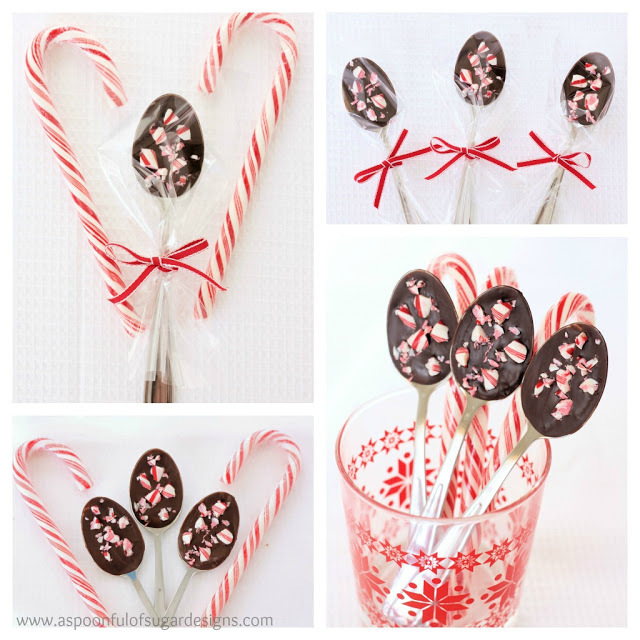 Wrap each chocolate spoon in a clear cellophane bag and tie with a ribbon. 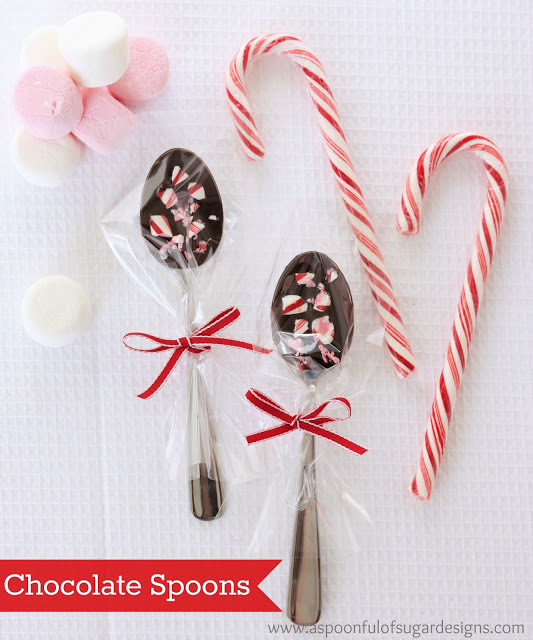 Chocolate spoons are such a decadent treat, and perfect for gift giving to chocolate and coffee lovers. Yummm…… We may need to make another batch before Christmas. I love dipping these into my coffee. 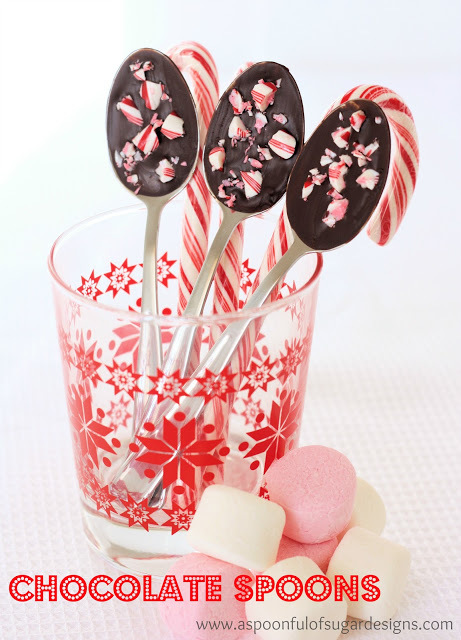 I’ve never tried them with crushing candy cane bits, which is such a great idea, and makes the spoons even prettier. I will be making these to put with my hot choc mixes for Christmas too! Thank you for always sharing your ideas! These look really great. I was thinking that a little bourbon in the chocolate could be a hit. I definitely need to make some. Thanks for the post. I love this idea I will be whipping up some of these over christmas for sure! Yummy!I’m definitely going to have a go making some of these. This is a truly wonderful idea, thanks so much for sharing. Love this idea, something different, they look and I’m sure taste yummy…. These are such a great idea. Definately making them for the holidays. So cute. This sounds so tasty. It would almost be a shame to eat them because they look so good! what do you use for spoons? We used metal spoons that we purchased from a discount store, but plastic spoons would also work well. I USED TO MAKE THESE WITH WOODEN SPOONS. I LIKE THE IDEA OF USING PLASTIC SPOON SO THEY CAN BE GIVEN AWAY AS GIFTS.